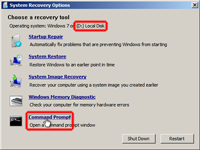 If booting freezes or you get stuck forever in the Windows Recovery Environment then you need to manually restore the automatically created backups for bootmgr and winload.exe. The main goal is to copy "bootmgr~1" to "bootmgr" (at the root of some partition) and "winload~1.exe" to "winload.exe" (in \Windows\system32). After that you will be able to boot. 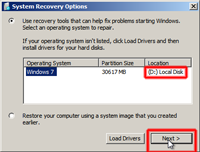 Once you can boot you need to finish restoring the backups using "Options > Restore Backups" in Windows 7 Boot Updater. You need to repeat this until it says no backups were restored. 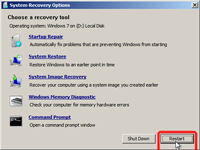 You can manually restore the files in many ways including: using a different OS on the same computer (dual-booting), moving the hard drive over into another bootable system, using a Linux Live CD, or using the Windows 7 Recovery Environment. I describe the last method below. Choose your language and keyboard settings and click "Next"
If using an install disk, choose "Repair your computer"
Click "View advanced options for system recovery and support"
Select your keyboard types and click "Next >"
Once you get back into Windows you need to delete any additional backups of winload.exe (if you ran Windows 7 Boot Updater more than once) by going to \Windows\system32\ and deleting all the winload~#.exe. 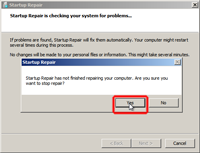 After that run Windows 7 Boot Updater and choose "Options > Restore Backups" to restore the other files. Repeat this last part until it says that no files were restored. Note: Below assumes that the Windows 7 Boot Updater created a backup called "bootmgr~1". 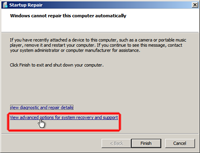 However in some cases you many need to use the system backup copy which is located at \Windows\Boot\PCAT\bootmgr in every Windows 7 installation (however this backup does not have any Windows Updates applied to it). All volumes on your computer are listed. The bootmgr is typically on the System or Boot partition (in the "Info" column). If you have a "System Reserved" (says "System Rese" under "Label") partition that is 100-200 MB with no drive letter (under "Ltr") it is probably on that one. If the volume has no drive letter (under "Ltr") we need to assign it a drive letter with the following commands. You need to adjust the volume number in the first command see the "Volume ###" column) and the drive letter to something available. It doesn't hurt to double check for the "bootmgr~1" file again with the dir command given in step 1. Once you get back into Windows you need to delete any additional backups of bootmgr (if you ran Windows 7 Boot Updater more than once) by going to where you found bootmgr~1 and deleting all the bootmgr~# [also do this for winload~#.exe]. 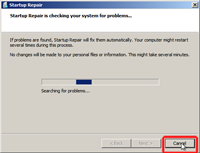 After that run Windows 7 Boot Updater and choose "Options > Restore Backups" to restore the other files. Repeat this last part until it says that no files were restored.